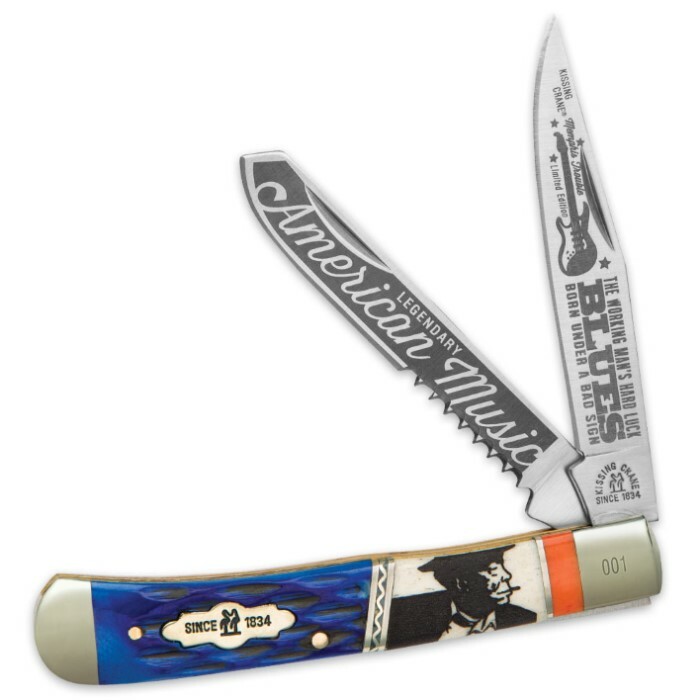 Kissing Crane Limited Edition Blues Trapper Pocket Knife | BUDK.com - Knives & Swords At The Lowest Prices! 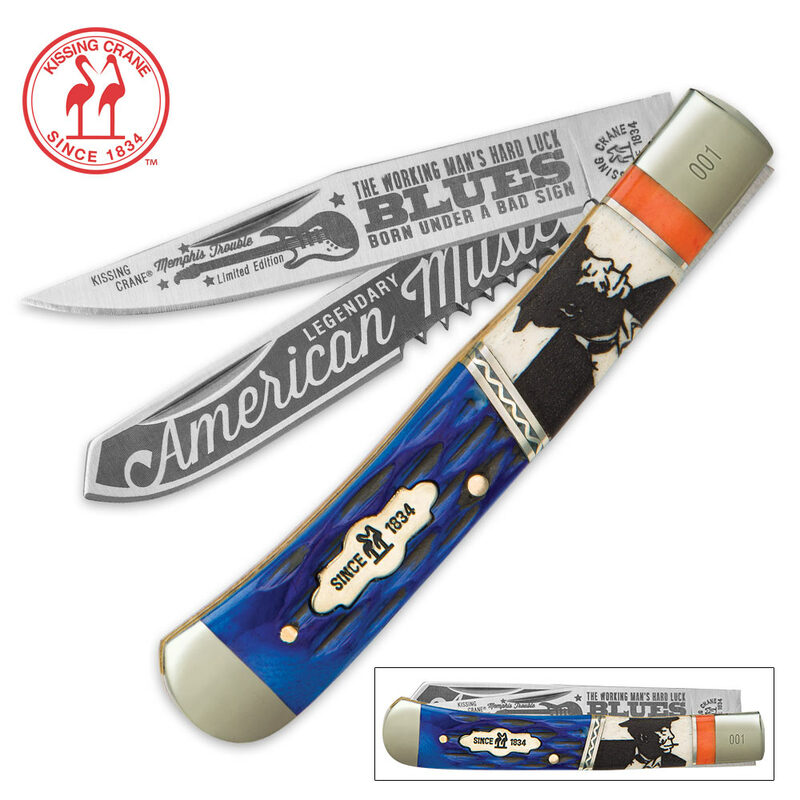 The Kissing Crane Limited Edition Blues Trapper Pocket Knife is part of our American Music series, which is a tribute to the roots of today’s music. 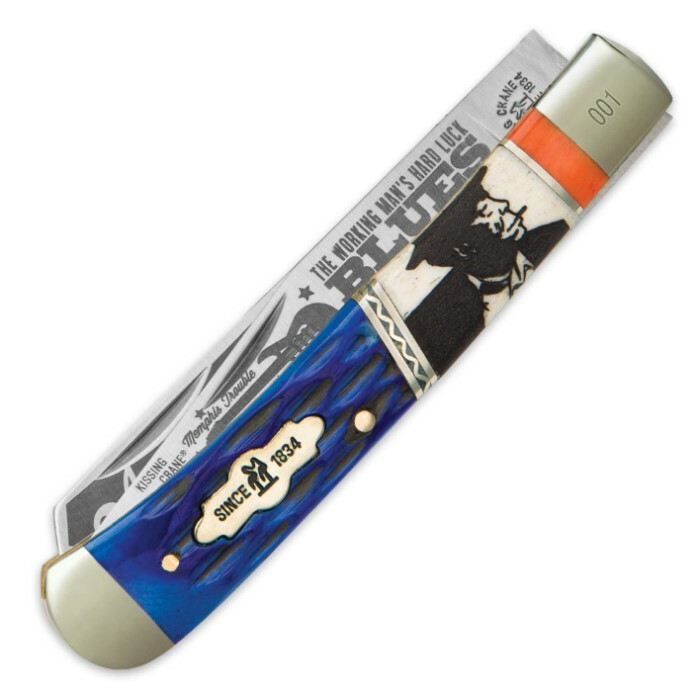 This limited edition pocket knife features razor sharp 440 stainless steel blades with Blues-themed etchings featuring a guitar and “The Working Man’s Hard Luck Blues.” The handsome genuine blue and white bone handle features the silhouette of a Blues singer etched in black. Polished nickel silver bolsters, a brass liner and the classic Kissing Crane cast shield complete this exquisite design. Each Kissing Crane pocket knife is individually serialized. Firstly, I was ABSOLUETLY blown away at the sharpness and sturdiness of both blades! I was also very pleased with the craftsmanship and the overall design of the knife. The real kicker is the price; less than $20 for a truly beautiful knife! As a Blues and Rockabilly musician, I couldn't be happier with this purchase! I'm definitely going to be buying the Kissing Crane "Rock N' Roll" knife next!